Rio Salado (Salt River) Habitat Restoration Area is located just south of Downtown Phoenix, AZ. The purpose of the restoration area, which includes a five mile stretch of the Rio Salado, is to restore the native wetland and riparian habitats associated with the river, which once flowed year-round through what is now Phoenix. of water basins that hold water year round. The result is an in an increase of wildlife habitat including numerous bird species, coyote, javalina, and other animals. In addition to birds and mammals, there has been an increase in the number of Monarch butterflies in this area. The Southwest Monarch Study has been tracking the Monarch butterfly and they found that an increased number of Monarch are wintering in Arizona. Typically, Monarch Butterflies follow a migratory path that either leads them from Arizona directly to Mexico or from Arizona to Southern California and then on into Mexico. In light of this new information, park rangers at the Rio Salado Habitat Restoration Area became interested in creating habitat specifically for the Monarch Butterfly. As a result of climate change, park rangers and staff at the Southwest Monarch Study expect that more Monarch will be wintering in Arizona as opposed to migrating south. The University of Arizona has been working in the Rio Salado Habitat Restoration area for a number of years, but then found that park rangers wanted to expand the habitat for Monarch Butterflies and were eager to jump on board to pursue additional funding. Arizona Project WET (APW) is a program for youth and teachers from all over the Phoenix Valley region. APW’s Water Investigations Program is specifically for middle and high school students and teachers. Students who participate represent schools from the most economically disadvantaged to the smaller, wealthy, private schools. Over the course of a year students are engaged in hands-on learning about water, culminating in designing their own investigation and applying their learning from the school year to find answers to their own questions on a field day. The field investigations make up half of each field day. The other half of the day involves habitat restoration projects. Over this past year the youth participated specifically in the creation of habitat for Monarch Butterflies. In order to successfully create habitat for Monarch Butterflies, UA formed partnerships with the nearby Nina Mason Pulliam Audubon Center and with the Southwest Monarch Study. 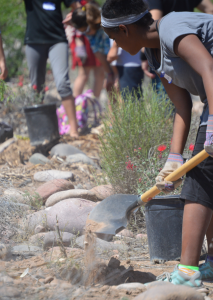 Together, over the last year, the Rio Salado Habitat Restoration Area (City of Phoenix Parks and Recreation) and the University of Arizona engaged 1,400 students and 51 teachers in creating 2.5 acres of habitat for Monarch Butterflies. The goal of the Water Investigations Program is to help students refine their environmental position over the course of the school year and to help them develop an ethic of conservation. An important part of this program is that it can help students understand that they have the ability to create change in their community. Students can see this change every time they visit the Rio Salado Habitat Restoration Area. An unanticipated challenge of the project was finding vendors to supply riparian plant species. Given that Phoenix is in the Sonoran Desert, there are not many companies who have regular supplies of wetlands and riparian plant species. UA overcame this challenge making future riparian and wetlands restoration projects easier. Partnerships were critical to making this project a success. UA did not necessarily have expertise in the field of habitat restoration so they leaned on the City of Phoenix and the Audubon Center for this piece of the project. The Audubon Center, though not listed as one of the initial partners, was working on habitat improvements for Monarch Butterflies at the time UA received funding for this project. It is important to reach out to those who are already doing similar work because often a greater impact can be made. Additionally, an AmeriCorps National Civilian Community Corps team was essential in providing adequate supervision for students as they installed plants, irrigation systems, and eradicated invasive species. Arizona Project WET develops water stewardship and STEM literacy by providing teacher professional development focused on direct student outreach that delivers or extends classroom learning. From the Arizona Water Festival Program to the new School Water Audit Program (SWAP) and Water Investigations Program (WIP), APW engages students in relevant learning about a subject that is arguably the issue of this century: Water. The mission of the Southwest Monarch Study is to: identify and describe the migration and breeding patterns of Monarch Butterflies in the Western U.S.; to monitor and encourage Monarch Butterfly conservation; and to provide a meaningful research project for citizen scientists of all ages.